One of the parents to address the investigating commission was Fred Guttenberg, shown here speaking at an event on April 9, who lost his daughter Jaime during the Feb. 14 shooting at Stoneman Douglas High. The 16-member commission, which was created by the Florida Legislature, has launched a probe into the “system failures” that led to the shooting in Parkland as well as the law enforcement response. The group is required to issue a report of its findings to state lawmakers by Jan. 1 of next year. The parents want answers sooner. “Why wait? … Many of our families still have other children that attend not only at [Stoneman Douglas] but other Broward schools,” said April Schentrup, whose 16-year-old daughter, Carmen, was one of the 17 people killed during the nation’s deadliest high school shooting. She addressed the commission during its first meeting, held Tuesday at Broward College’s north campus in Coconut Creek. 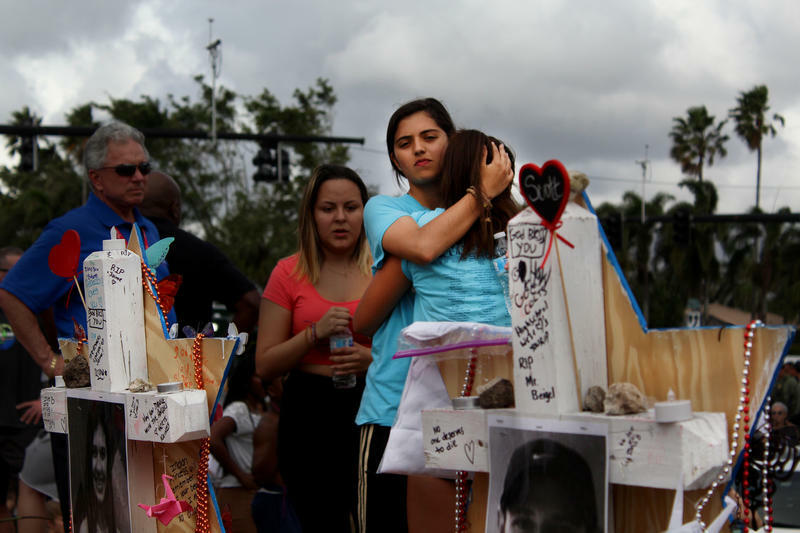 Fred Guttenberg, father of 14-year-old victim Jaime, pinpointed communication among law enforcement agencies and the Broward County school district as a major contributor to the incident, and he thought the problem should be fixed before next year. Pinellas County Sheriff Bob Gualtieri chairs the commission. He said there’s nothing stopping schools or other entities from immediately implementing ideas for changes that come up during their meetings. The commission also watched an animation that showed the 1200 building, where the shooting took place, from above. In it, a black dot — representing the confessed shooter — moved through the building. A narrator announced each time the shooter injured or killed a student or staff member, shown as green and blue dots. 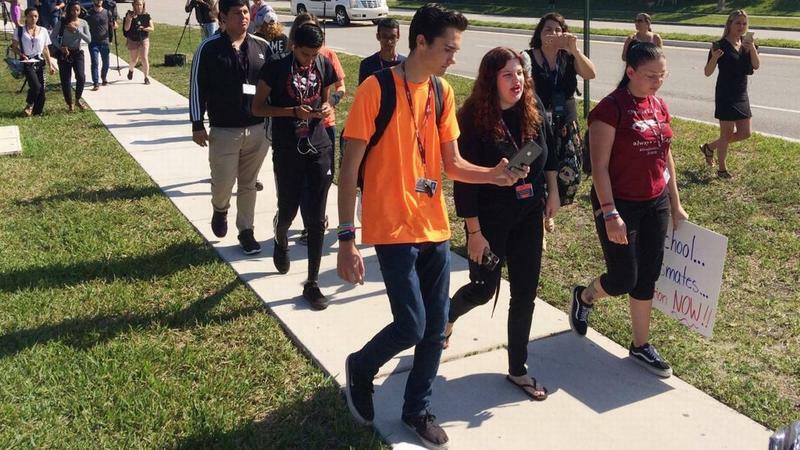 After the daylong meeting, members of the group traveled to the Stoneman Douglas campus in Parkland for a tour of the shooting site. But they did not enter the 1200 building, which is slated to be demolished eventually. The commission’s members were appointed by Republican Gov. Rick Scott and legislative leaders and include three fathers of students killed in the shooting. Max Schachter is one of them. His son Alex was 14. Schachter said the animation was difficult for him to watch, and he doesn’t know if he’ll be able to watch any raw footage from that day. He initially thought the commission’s tour was meant to travel through the building — which others who’ve visited have described as being splattered with blood, bullet holes and the abandoned belongings of the high school students. He let the leaders of the group know he didn’t want to see it. Schachter said he’s frustrated more hasn’t already been done to prevent another shooting. For example, he said, it should be easier to make sure school and classroom doors are locked. The commission explained that classrooms at Stoneman Douglas High could only be locked from the outside. “This could happen tomorrow and nothing has changed,” he said, stressing that the group should find ways to make schools safer and implement them immediately. Then they should try to get schools in other states to put into place the same measures. Schachter said his motivation, in part, is to protect his three other children. His oldest son is a senior at Stoneman Douglas. One of his daughters is in middle school and expects to enroll there in a couple of years. Gualtieri said some government agencies have not cooperated with the commission’s inquiries but wouldn’t name which ones yet. He said their hesitation might be because they’re dealing with civil lawsuits related to the shooting. The group has subpoena power. The commission agreed that any future meetings will be held in South Florida — even though many of the members are from other parts of the state — to ensure parents of the victims and other members of the community are able to attend. Members said they’d prefer to hold multi-day meetings periodically rather than shorter meetings more often, to limit their need to travel. Gualtieri said the commission would finish its investigation in late fall, so staff members could complete the report by Dec. 1. Then the commission would have a month to review and finalize it before submitting it to the Legislature. Since holding two town hall meetings last week, the steering committee in charge of the Marjory Stoneman Douglas Victims’ Fund is moving along quickly in the process to get money to people affected by February's mass shooting in Parkland. But people who still want to give input in how those funds should be dispersed have one more chance to do so at a meeting in Coral Springs on Tuesday. 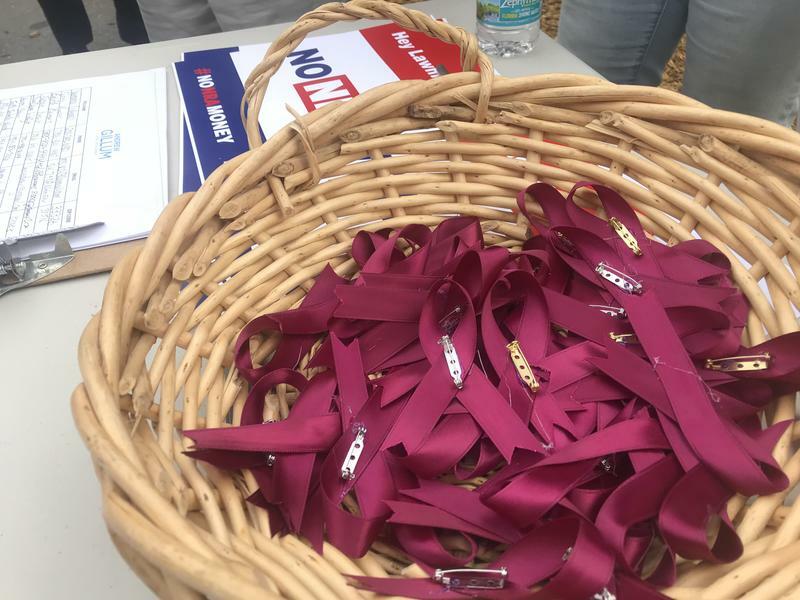 It has been almost two months since Marjory Stoneman Douglas High School students came together to form the Never Again gun reform movement, following the mass shooting that occurred on campus on Feb. 14. A core group of surviving students became the leading voices on the issue of gun reform in the country. But Stoneman Douglas High has more than 3,000 students, and some of them feel that their stories are not reflected in the narrative of their peers.